The origins of Lee Mount Baptist Church lie in the mission of Birchcliffe General Baptist Church, Hebden Bridge, and the impact of industrialisation and global economics on rural weavers. There had been a Particular Baptist Chapel in Heptonstall, established by Thomas Greenwood, pastor of Rodhill End and Stoneslack, between 1717 and 1724. However, by the end of the 18th century, this church had ceased to meet and, in 1807, 37 members of Birchcliffe General Baptist Church were dismissed to form a church in Heptonstall with James Taylor, a nephew of Dan Taylor, as minister. They met first in the old Particular Baptist meeting house while building their own church at Heptonstall Slack which was opened in 1808. By 1822 they had 200 members and Richard Ingham, a native of Slack who had earlier trained as an Anglican priest at Oxford University, became their minister. He resigned in 1834 to become pastor of Grange Road (Tetley Street Memorial) Church, Bradford when membership had reached 300 to be succeeded by William Butler under whom membership reached 502 in 1844 while its school attracted 700 children. At the time it was the fourth largest General Baptist Church in the country. 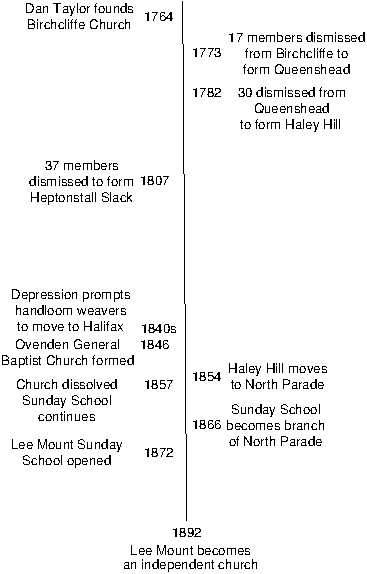 Then an economic downturn affected the textile workers who made up its congregation and many families left the area, among them the family of Samuel Greenwood who moved to Halifax. He and other Christians from Heptonstall Slack and Birchcliffe churches began to meet as a prayer group in Ovenden in 1844. Their first meeting place was a cottage in Sod House Green and, having obtained the use of two cottages, on 30 November 1845 they opened a Sunday School. In May 1846 Rev. Butler from Heptonstall Slack officiated at the formation of Ovenden General Baptist Church. But in 1857 it was dissolved though the Sunday School continued. 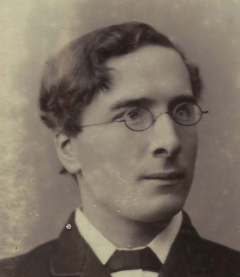 Though some of Samuel Greenwood’s family continued to live in Ovenden and to work at John Crossley’s, he himself moved to Bradford where he joined Trinity Horton, which had been formed by 41 members of Westgate in 1851, Westgate’s centenary year. It is possible that other members of the original congregation did the same. in 1854 they signed an Agreement to rent Ovenden Temperance Hall though they still went on looking for a permanent site of their own. Though the church ceased to exist, the Sunday School continued to operate, later renting accommodation in Josiah Stead’s School, and the Sunday School teachers organised services from time to time, with the assistance of North Parade Baptist Church, which had moved from Haley Hill in 1854, and of which some of the teachers were members. However, this support was withdrawn in 1862. In 1865, however, the minutes of the church are re-opened and a decision was made to apply to became a branch school of North Parade Baptist Church and to open a building fund to establish a new school, not in the middle of Ovenden but at the southern end, in an area then called Broad Tree. 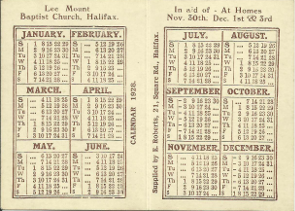 By 1870 they were confident enough to apply for charitable status as ‘Lee Mount Baptist Chapel and Schoolrooms’ which was granted on 15 January 1871 . The name came from a happy mistake in one of the donations to the Sunday School and eventually the new Sunday School gave its name to the district which previously was known as Broad Tree. The church members remained a branch church of North Parade until 1892 when the merger of the Particular and General Baptists into the Baptist Union prompted the creation of an independent church which could become a member of the Yorkshire Baptist Association in its own right. 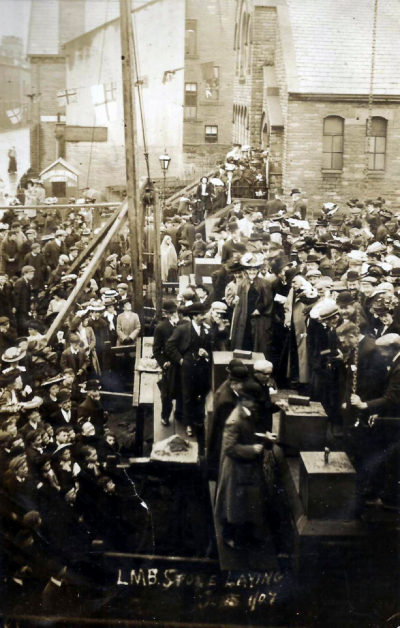 134 members were dismissed from North Parade Baptist Church in 1892 to form the new church. The Sunday School provided accommodation for Lee Mount Primary School before it had its own building and, while the opening of St George‘s Church in 1877 provided some anxiety about the loss of pupils, the first vicar, Revd Israel Parkinson, became a regular preacher at the branch church. In 1893 J.H. Robinson became its first minister and in 1897 a Building Fund was opened with a view to building a new church building alongside the Sunday School. J.H. Robinson was succeeded by D.B. Davies in 1899. During his ministry the Sunday School celebrated its Diamond Jubilee Re-Union. However, with the arrival of F.W. Duncombe in 1906, the focus turned to the new church building. He led the campaign for a new church building alongside the school to develop the emphasis which there had always been on young people by providing more room for activities such as the Band of Hope and Christian Endeavour. The sod cutting took place on 6 April 1907 , the stone laying on 3 October 1907 and the church opened on Sunday, 31 May 1908 and seated 760; at the time £2,701 of the £4,400 needed for the building had been received. F.W. Duncombe left in 1911 to be succeeded by J. Brown in 1912. 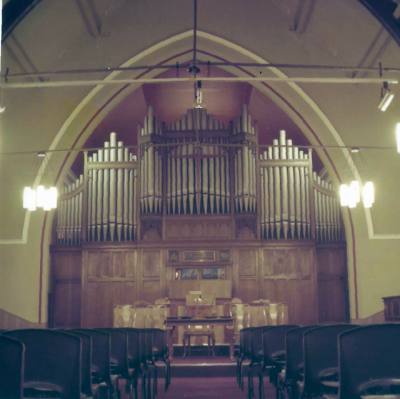 In the same year, the church decided to update its conditions of membership and in 1915 held a series of services in thanksgiving for clearing the debt on the building. In 1919 J. Brown was succeeded by H.J. Carr who presided of the celebrations to mark 50 years since the opening of the Sunday School building, including the production of Jubilee and Memorial . H.J. Carr left in 1923 to be succeeded by R. Tallontire in 1925. 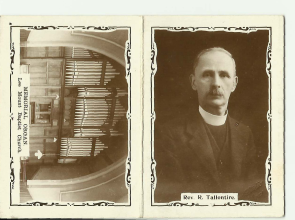 We have a memento of him in the form of a small fundraising calendar from 1928 with photographs of him and the new organ on the outside. The following year the church entertained the Wesley Choir. R. Tallontire left in 1933 to be succeeded from 1934 to 1938 by A.H. Sutherland. There was then a gap until the induction of Arthur Dalton in 1941 but he left the following year to be succeeded from 1944 to 1950 by O.L.F. Wade.. A feature of this period was the two day festivals celebrating the work of the Church and Sunday School, variously called ‘A rose garden’ and ‘At home’. Walter Bailey arrived in 1952 and it was during his period that the church gave up its independence, transfering its assets to the Yorkshire Baptist Association. There is a fascinating shapshot of the work of the church at this time in the 1956 Year Book. Walter Bailey oversaw the jubilee appeal to repair and redecorate the church, the production of a brief history of church entitled Enterprising journey and the jubilee celbrations before leaving in November to become pastor at Laird Street Baptist Church in Birkenhead. Reg Cook arrived in 1960 and introduced ‘Family Church’ before leaving in 1971 to be succeeded in 1972 by Michael Jackson. A meeting of the BMS Auxiliary and a Fellowship Dinner hint at church life at this time. From the beginning the emphasis of the Church has always strongly been on the Sunday School, and the work of training the young has been maintained. It is a cause of rejoicing that so many young people are drawn into various organisations, and not only trained as good citizens but are introduced to the fellowship of the church, following the introduction of Family Church. In 1973 the Church appointed its first woman secretary after the very sudden and sad death of Mr Gordon Smith who had been a much loved secretary for 14 years. With the widening of the A629 in the 1970s and problems managing two sets of buildings, it was decided to divide the church building horizontally to provide a Sanctuary on the higher level and an Activities Hall below. This was opened on 3rd December 1977 . In 1992 the church celebrated the centenary of its becoming an independent church. Having survived for nearly half a century before it appointed its first full time minister and seen frequent ministerial changes since then, Lee Mount has always relied on strong lay involvement.Lee Mount has always been well served by able, faithful and devoted workers in official positions, in children’s work, with uniformed organisations and for communal activities. Norman Thompson served as Church Treasurer for 30 years until 1978. The death in 1972 of Gordon Smith who had been Church Secretary for 14 years was a grievous blow. His successor Mrs Doreen Stansfield became the first woman to hold the post and served until 1982. On every occasion when both positions have become vacant others have stepped in to fill them. In our period there have been five changes of Secretary and four of Treasurer. In search of a city said of Mrs Stansfield’s appointment, Male chauvinism died a long time ago at Lee Mount. Three Secretaries and one Treasurer have been women, as are the present holders. The first lady deacons had been appointed in the 1940’s. At present the full complement of the diaconate has both men and women. In 1997 so many ladies were involved in all the work of the church it was agreed to end the Ladies’ Fellowship. Three members of the church have been ordained and entered the Baptist Ministry. In 1990 Jane Powell commenced training at Northern Baptist College and in 1993 became minister of Steep Lane Baptist Church. In 1999 Jane Ledingham started full time Girls’ Brigade work at Didcot, from which she trained for ministry at Regent’s Park College. She served as minister at Gildersome Baptist Church and as Regional Minister for Mission at the YBA. She married Stephen Day, a Methodist minister, and they now serve together at Germiston Central Methodist Church in South Africa. Alan Vine was Lay Pastor at Denholme Baptist/URC Church. In 1970 Rev. W.B. Wilson (former member and part author of the 1968 history) and Mrs Wilson returned to worship at Lee Mount, after leaving 42 years earlier to enter the ministry. Miss Amy Jagger, a former member, worked as a missionary in China in the 1930s.